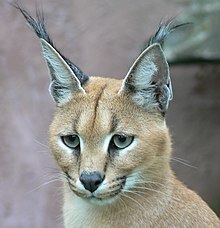 For other uses, see Caracal (disambiguation). Caracal is a genus of the subfamily Felinae in the family Felidae. Previously, it was considered to be a monotypic genus, consisting of only the type species: Caracal caracal, commonly called caracal. Genetic analysis has shown that caracal, African golden cat and serval are genetically closely related and diverged from a common ancestor about 5.4 million years ago. Therefore, it has been suggested to subordinate all of them to the genus Caracal. This taxonomic classification is used in the IUCN Red List for the African golden cat. It is used as a synonym for the serval. ^ Johnson, W. E.; Eizirik, E.; Pecon-Slattery, J.; Murphy, W.J. ; Antunes, A.; Teeling, E.; O'Brien, S.J. (2006). "The Late Miocene Radiation of Modern Felidae: A Genetic Assessment". Science. 311 (5757): 73–7. doi:10.1126/science.1122277. PMID 16400146. This page was last edited on 30 October 2018, at 08:43 (UTC).